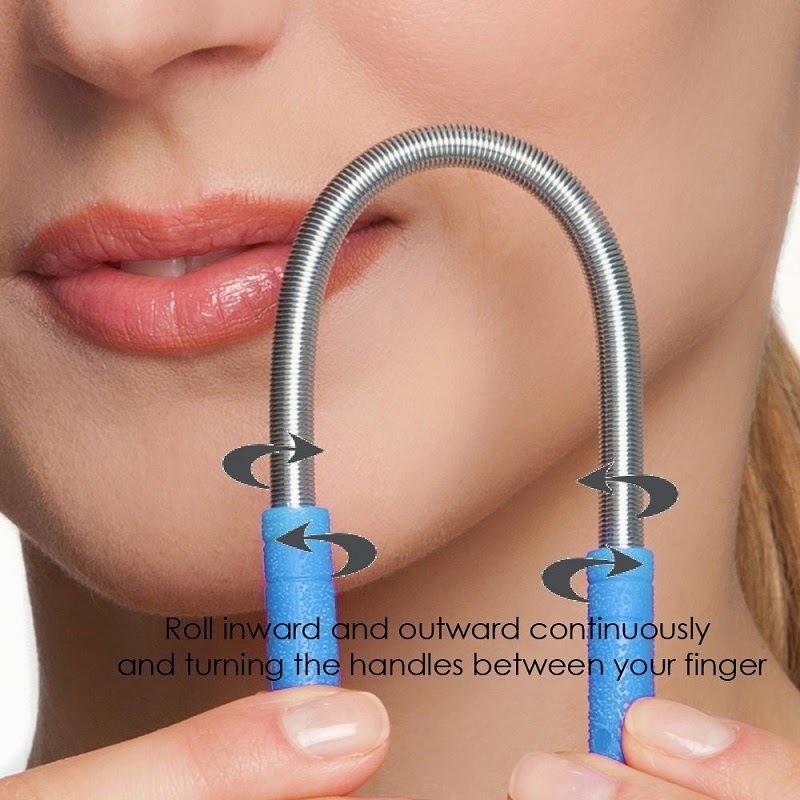 "ur Facial Hair Remover Threading Tool will whisk away those unsightly hairs quickly, effectively and PAINLESSLY! Constructed out of stainless steel, this is a long, lightweight threading tool that traps hairs between its coils. Bend it into an upside-down "U"; hold it against unwanted hair and then twist. The tool instantly pulls hairs out of the follicles, roots and all. The process is incredibly quick and absolutely pain free!" I was sent the facial hair remover (and bonus eyebrow razor!) from Bellesentials to review. This set costs $10.95. Shipping is free with Amazon Prime. This set arrived in great condition. There were no dents, defects, nor issues during shipment. The package included both the facial hair remover and the bonus eyebrow razor. The pack measures 8.25" x 2.25" at its widest points. Everything was packaged inside of a cellophane bag with a cardboard insert. The front and the back of the box are identical. It labels the product and material. The top is easy to open. There weren't any instructions included which was kind of a bummer. Hair removal systems are probably the most overlooked beauty necessity. I usually use tweezers, but those can be quite painful. I'm always looking for an effective remover that isn't as horrible as tweezers. I was actually looking forward to trying this, it looked so much different than anything I've ever used before. The eyebrow razor is really sharp, so good thing it has a nice cover on it. This is the bonus item, and I find it easy to use. The actual hair remover is a bunch of coils, and there are two plastic handles. It measures almost 8.0". The coils are really close together, and it's very flexible. The plastic handles have little grippers on it, so it's quite easy to turn. Handles a large amount of hair at one time. There were not any instructions. I was doing this completely wrong, so I had to go online to figure out how to use it. I think instructions should be included. This isn't totally pain-free. It's a lot less painful than tweezers, but you still feel it. This is definitely one of my top-used things in my bathroom drawer. It works the best when you get out of the shower while the follicles are relaxed. I definitely recommend this! Are you wanting to try the Bellesentials Facial Hair Remover, too? Click the link below, and order away!